Son of Jesse and grandson of Daniel Boone of Kentucky, Albert Gallatin Boone was one of the most notable personalities of Westport, Missouri. At age 17 he joined the second Ashley-Henry trapping party out of St. Louis traveling to the Upper Missouri River. Later, he worked at the Fort Osage trading post in western Missouri mastering the Osage language and learning several other native tongues. He then became an Indian trader before opening a store and warehouse in Westport, Missouri to outfit travelers along the Santa Fe and Oregon Trails. 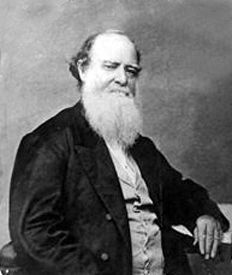 With the opening of the Kansas Territory, he became the agent of Southern Pro-slavery interests for political control of the territory. In 1861, William Bent of Bent’s Fort resigned as agent for the southwestern Indians and recommended his friend A.G. Boone as successor. Upon appointment, Boone moved with his family to Colorado in 1861, selling his property in Westport to James Bridger. With his brother, Van Daniel Boone, A.G. bought a 1,400 acre ranch south of Pueblo, at a place now known as Boone, Colorado, where he opened a trading post. He served as U.S. Indian Agent for the Cheyenne, Arapahoe, Kiowa, Comanche and Plains Apache tribes from 1859 through 1861, at which time he was removed from government office because his loyalty to the Union was in doubt. In 1868, Boone was made deputy to Colonel William B. Hazen, the newly appointed agent for the Commache and Kiowa at Fort Sill, Oklahoma. He died at his daughter’s home in Denver in 1884.